With afternoon temperatures hovering listlessly around the forty Celcius mark the best time for walking the hills around Ferma is, without doubt, just as the sun is beginning to rise. As the pre-dawn blues of Strongoli begin to melt in its rays only the olives, pines and lentisc retain their green. A lingering Bugloss fades its final flowers from pink to violet but the overriding impression is one of a sepia landscape. It is a time of grasshoppers, crickets and dragonflies. I think we'll head off into those pines for a bit and try to find some shade. This is a part of the gully we explored a few years back inA Kingdom in the Pine Woods. Bats, whales shrews, mice and ourselves for that matter are all placental mammals with a common ancestor from about 80-100 million years ago. From this ancestor two separate branches evolved; one containing ourselves and other primates along with rabbits and rodents (which includes the mice) and one containing the bats and a host of other mammals too numerous to mention. So we and the mice waved goodbye to the bats and the next group to go their own way included the hedgehogs, shrews and moles. Surprisingly then, bats are more closely related to whales than they are to either shrews or mice. Who'd have thought it? 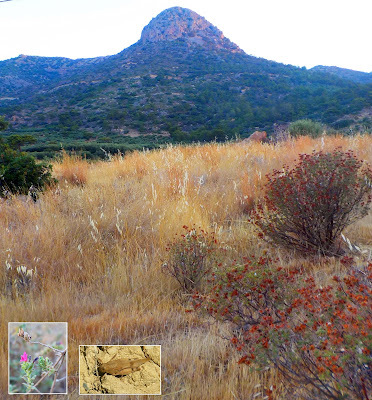 I have said before that one of the great things about studying nature is that you can do it anywhere at any time. For this past week I have been given the chance to prove my point as I have been incarcerated in Ierapetra General Hospital looking after my good lady wife who has been having rather a rough time of it recently. 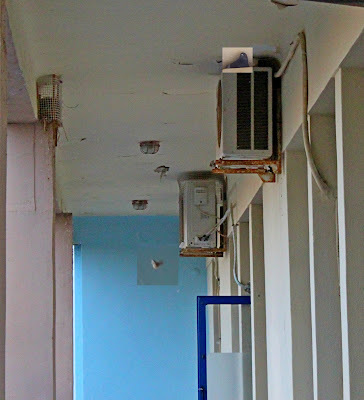 One of the lovely things about Greek hospitals is that many of them have balconies which attract nesting birds. On our balcony measures had been taken to deter nesting pigeons which inadvertently provided ideal sites for House Sparrows. Undeterred the pigeons squeezed onto the top of an air conditioning unit which a goldfinch would have thought twice about and tried to construct a nest by dropping sticks down the back and waiting to see if they fell through or not. Who should beware of this beetle? This is Chlorophorus varius happily pollinating a Globe Thistle. When he was a young grub however you'd find him in peach, apricot, plum and almond orchards where he can do considerable damage. Although present in much of mainland Europe, the Middle East and North Africa I can find no record of it occurring in Crete.